The second day of the Delhi Times Fashion Week so much like the first one, but also nothing like it! Emotions ran high, as we saw the best the fashion world had to offer – but as the first day was all about elegant, timeless pieces, the second day was a riot of colour, with a high dose of comfort, grace and a hint of avant-garde! The first show began by the showcase of the Spring Summer collection by Madame. It was all about comfort and style – the two qualities modern day women look for in their everyday clothing. The second show was by the students of the World University of Design. It showcased a high dose of colour, experimental silhouettes, and a much-needed dose of avant-garde. With geometric prints and primary colours, the collection went back to the basics, but was anything but that! Hopscotch as usually brought a whole lot of chic, along with a whole lot of cute! 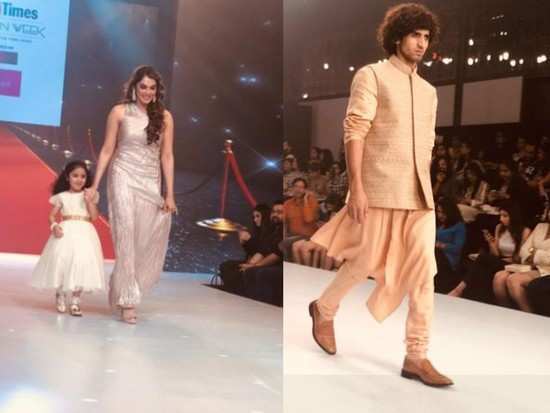 We say Bollywood actress Isha Koppikar Narang walk the ramp with her daughter Rianna as showstoppers. Ahmad Ali’s label, Zilline showcased some royal realness in their ethnic men’s wear collection. We even saw Rahul Dev own the ramp in an ensemble fit for a royal groom! Niki Mahajanç collection was elegant and all white - perfect for a summer wedding! The day ended with Ashima Leena’s ostentatious collection of opulent Indian wear. 2Day 1 of Delhi Times Fashion Week was all kinds of glamour and fun! 4Sonam Kapoor slayed in white, *again*! 5Shilpa Shetty’s latest look is proof that Orange is *definitely* the new black! 6Sonam Kapoor’s opulent white ensemble has a personal detail you may have missed! 8Day 3 of Bombay Times Fashion Week was a glamorous one!